Click to get the treat bag topper. Although party favors are never a required part of your celebration, favors can be a fun way to thank everyone for attending your family reunion. There are favor options available to fit every event size and budget. Making your own family reunion favors is the best choice if you are planning a relatively small event and have a limited budget. To make the process easier, consider enlisting a group of relatives to help create party favors for everyone. If your budget is limited, printable party favors are an excellent choice. This treat bag topper is perfect when paired with wrapped chocolates or jelly beans and a few peanuts. Personalize the treat bag topper with your name and the date of your event. 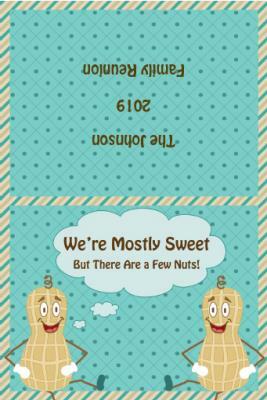 Print treat bag topper onto white card stock. Use paper trimmer to trim graphics to the desired size. Fill clear plastic bags with candy. Add a peanut or two to each bag. Fold your treat bag topper in half. Staple the topper on the clear plastic bag. 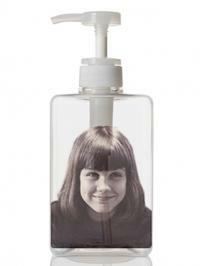 Hand soap personalized with a special family photo is a pretty yet practical choice for your family reunion favor. Keep the cost of this project down by looking for soap at your local dollar store. Use Goo Gone to remove labels from your soap dispenser. Print your photos onto photo paper. Laminate your photos using the peel and stick clear laminate. Open the soap dispenser. Curl the laminated photo so it fits inside the opening. Gently push inside the bottle, so it will uncurl when it's all the way to the bottom. The weight of the soap will help push the image towards the back. Wipe any small amounts of soap off the bottle if any comes out while you add the laminated photo. Put the cap back on the soap dispenser. Add a ribbon and your family initial charm around the top of the bottle if desired. With a little work, plain wooden picture frames from your local craft store can become special keepsakes from your family reunion. Use a photo that is either a large group picture or an older photo of your common ancestor. Paint your wooden picture frame the desired color. When the paint is dry, stamp the tree image on the lower left or right hand corner. 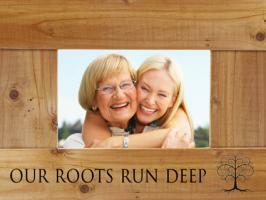 Write "Our Roots Run Deep" next to your image. Add the desired family photo. DiscountMugs.com has solid colored frisbees that can be personalized with clip art and the text of your choice. If you order 100 for your family reunion, the cost is just $1.07 per item. 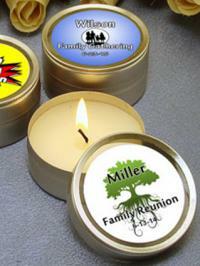 WrapWithUs.com has personalized family reunion candle tins that can be printed with your name, date, and one of 14 different logo choices. The minimum order is 20 candle tins at $.99 each. Vistaprint has a simply designed canvas tote bag you can personalize for your family reunion. Bags start at $8.49 each. Personalized reunion t-shirts also work well as party favors. Shirt prices vary based on the options you select, but most shirts will be about $10 each after taxes, shipping, and setup fees are calculated. Little details like personalized party favors make a big difference in creating a festive atmosphere for your family reunion. However, the most important thing is that you focus on having fun spending time with your extended family.